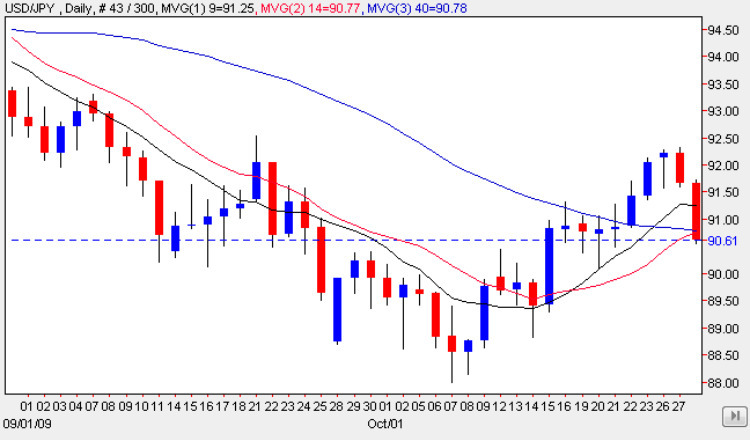 The three candle hanging man pattern was duly confirmed yesterday with the yen to dollar pair ending the trading session with a wide spread down candle, which closed marginally below all three moving averages, and suggesting that the recent rally may have come to a temporary halt. The technical picture however is far from clear for the yen to dollar pair, as we have several issues to consider on the daily chart. Firstly it could be argued that yesterday’s close actually found some support from the crossing of the 40 day and 14 day moving averages, and indeed this price level is also a minor support region adding some weight to this analysis. However this is counterbalanced by the bearish hanging man signal coupled with the failure to breach the 92.50 resistance level which halted the recent rally. In addition, and longer term, we could construct a trending channel with lower highs and lower lows which would suggest that the bearish tone ( longer term ) remains firmly in place, but against this technical analysis we do, of course, have to bear in mind the Bank of Japan who will always step into the market to protect theYen should they feel this is in the interest of the Japanese economy. The recent low at 88.50 was a case in point, with some anlaysts suggesting that 85 would be the trigger point, but on this occassion they seem to have entered the market sooner rather than later. So in summary a mixed picture for the yen to dollar and one that is far from clear. Should the downwards pressure continue today then we could see retest of the 88.50 level in due course, and possibly a bounce back from here once again. Items of fundamental news for the Japanese Yen came overnight with the Preliminary Industrial Production numbers which came in better than forecast at 1.4% and the CSPI (Corporate Services Price Index) which too came in better than expected at -3.2%. All the news items for the US are covered in the main eurodollar site. You can keep up to date with all the latest fundamental news on the economic calendar, latest currency news and live currency charts by simply following the links. I have also included details on an excellent ECN broker.